If you play blues harmonica chances are you play shuffles a lot. It’s a nice groove and typically the first groove you learn to play. Since you probably play it a lot it has been etched into your brain and you don’t have to think too much to follow the groove. But what happens when you run into tabs or musical notation that are a bit more complicated? What happen when you step a little bit outside what you are used to? If you are lucky you will have a sound file where the riffs you are working on is played, either in isolation or in context with a backing track or a band. In that case it is a matter of listening to the music at the same time as you are reading the tabulature and try to sing along with the rhytmic pattern. If the recording is too fast for you, you can use a program like The Amazing Slowdowner to play it at a more comfortable speed. This step is quite important to make sense of what you are trying to learn. When the rhytmic pattern is in your memory you can start worrying about the pitches as well. The process becomes something like read, listen, read, sing or hum, play on the harmonica. Try to use your ears more than your eyes. If you want to go the technical route you can use a MIDI sequenser or similar program to program the pattern and have the computer play it back to you. Not a bad choice but not always feasible. This list definately does not cover all possible combinations but it is a good starting point for working things out. You have to pay attention to any rests in the pattern and put together the phrases you need to get the complete harmonica phrase you are working on. Don´t forget to use a metronom, rule number 9 of Hertzberg´s Rules of Practice. Let me know if you have any questions on this and if it has been helpful to you. Stay in touch by subscribing to my newsletter below. Maintenance may not be at the top of your mind as a harmonica player but it is something we all have to deal with. I bet that at least once you have experienced a stuck reed in one of your harp. Quite likely the reed was stuck either by a foreign object that came with your saliva. Sugar residue can also build up if your mouth is not clean when you play. In this article I will give you a few pointers on how to keep your harmonicas clean enough to avoid these mishaps. The first thing you should do is make sure that your mouth is as clean as possible before you start playing. What does not come into your harmonica will not have to be cleaned out. The best process is of course to always brush your teeth before playing. Although most people understand this, it is not always practical or feasible. Some people will flat out ignore this advice. I have to admit that I don’t always do this myself unfortunately. The second best thing you can do is to rinse your mouth with water before playing. I try to keep this as my minimum standard and it works quite well. Even if you don’t brush your teeth or rinse your mouth with water there are a few things you can keep in mind, especially during a jam session. When you have finished playing, don´t forget to tap the harmonica lightly to remove any moisture. To keep moisture build up to a minimum I have found that warming the harmonica in your hand before playing helps. All of the above will help make sure that foreign objects don’t make it into your harps. Even with the best preparations and intentions once in a while your will end up with a harmonica in need of some maintenance. 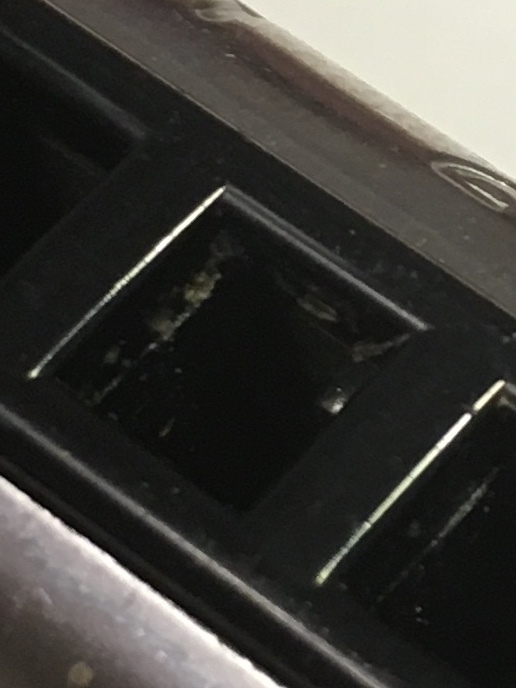 The first thing you may notice is build-up of crud in the holes. See picture below. The first sign you need to clean your harmonica. To handle this I recommed tootpicks, gap toothbrush or a reed lifter tool. It is very easy to gently clean off the crud from the harmonica. Cleaning like this will keep your harmonica in good order for quite some time. 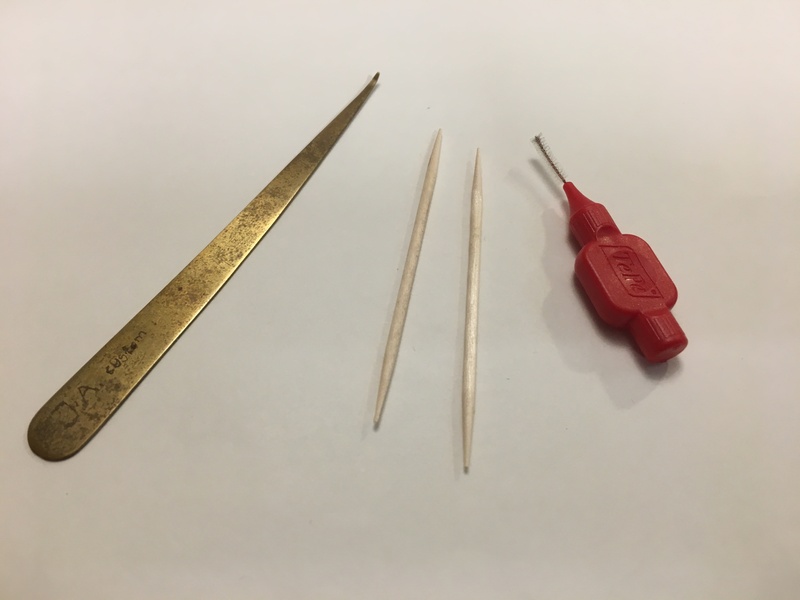 If a reed seem to get stuck you can use a tooth pick or the reed lifter tool to gently put it in motion. If these actions don’t do the trick you may have to do some more cleaning. When you take a harmonica apart you get a whole lot more options for cleaning. 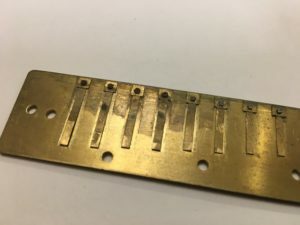 Most likely you will find that both the reed plate and the comb are dirty. The first step to cleaning here is to use a soft toothbursh. Make sure you are not pressing too hard and brush in alignment with the reeds. 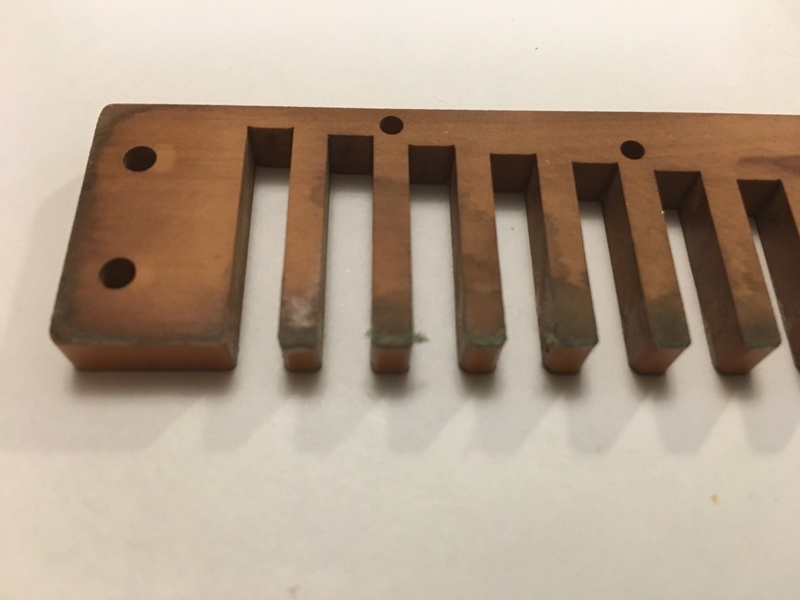 You can also use water or some form of mild cleaning fluid on the reed plate. Make sure to wash it off before assemblying the harmonica. Do not use a lot of water on an unsealed wooden comb, the wood will absorb the water. If you are unlucky the wood will swell and warp. Id you have a plastic comb you can use a whole lot more water to clean it. You might wonder why so much dirt make it in between the reed plate and the comb. It can di so because the reed plate and the comb are not 100% flat so there will be voids. If you buy a high end custom harmonica this will be less of a problem. These harmonicas have a tighter seal because of the flatness of the comb and reed plate. It will however not completely eliminate the problem. To get everything completely clean you need some more heavy duty equipment. I use a ultrasonic cleaner to clean reed plates, cover plates and screws. 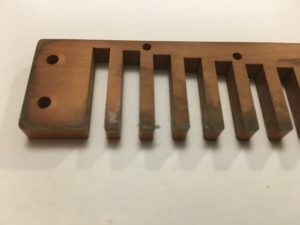 I do not recommend ultrasonic cleaning for wooden combs. The cleaner uses high frequency vibrations to basically shake the dirt off. It is very effective and can get everything more or less completely clean. To make the cleaning even more effective I would recommend a cleaning liquid such as the EM-070 or similar which is normally used to clean dentures. 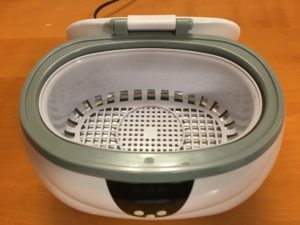 Just make sure to clean it off with water after the ultrasonic cleaning. As you can see there are many levels to maintenance and doesn’t have to be a bother. With a few tools you can come a long way. Let me know if you have any questions and don’t forget to sign up for the newsletter below. When it comes to practicing blues harp the top hurdle facing people is often time. In our effort to get the most out of our practice time we look for the optimal circumstances. However in doing so it is all to easy to end up not practicing at all. This was a challenge for me for a long time, I wanted to practice a lot but if I couldn’t find at least an hour of uninterupted time I just didn’t practice at all. This is of course very counter productive. For me the big change when I first learned about “kaizen” and then the best blues harp exercise you can do on the harmonica. The word “kaizen” is a japanese word that means “change for better” and it is often used to describe that an organisation continuously improve all parts of its operation. What is very appealing with this is that even small improvements building on top of other small improvements will result in big improvements overall. Another way of looking at it is that if you become 1% better at something every day the formula becomes 1.01 x 1.01 x 1.01… and you wil be 2 times as good as when you started after 70 days (not 100 days) and 4 times as good after 140 days. The 1% gain is not added to where you started (day 1) but to where you were the day before. This is of course a very theoretical way of looking at things but at least it opened my eyes to the compound effect of small improvements. I personally reformulated this to “it is better to practice a little bit every day than to cram a long session once a week”. I touch on this as well in my article on great harmonica practice. The exercise I mentioned before is known as “train imitation”. It is a very simple exercise in which you play two inhaling chords while articulating “ah-ah” followed by two exhaling chords while articulating “who-who” on holes 1-2 or 1-2-3. You start slow and accelerate and decelerate to create the sound of a steam train. You continue for as long as you like. For dramatic effect people often start and finish with a train whistle. You get this by inhaling around holes 3-4-5 combined with a little bit of hand or throat tremolo. In the beginning this exercise is quite challenging. You may not get up to any great speed at all and you may find the tone weak. However this is exactly what this exercise will help you with. It will teach you to relax and balance your breathing so that you don’t fill up on air or run out of air. The relaxation in your posture and your embouchure will greatly improve your tone. Whenever I can I like to get instruction from my good friend Joe Filisko and he is a great proponent of the train imitation. In fact when I have taken his classes at Harmonica Masters Workshop in Trossingen he has talked about train imitations EVERY year. Unfortunately I ignored it the first couple of years but in 2012 (I believe) I made a comitment. I promised myslef that I would do train imitations every day for at least 30 seconds. The idea with 30 seconds was that it was so short that it would be almost impossible for me to skip it, you can always find 30 seconds. What happened was that it was quite easy for me to keep that promise. Most days I actually practiced for quite a bit longer than the 30 seconds. Not only that, I started noticing that my tone was improving and I was more relaxed than before. After about 2-3 months I felt that my tone was at least 100% better. Also my breath control was at a whole other level than before. I think this decision has been the single most effective for developing my own playing. When I teach people blues harp now the train imitation is the first thing I teach them. I tell them that this is something they can keep practicing for the rest of their lives. A cool thing with the train imitation exercise is that it is actually an early blues harp song in itslef. You just need to build it out a bit and add some effects. At HMW 2014 I had worked up the nerve to show my train imitation to Joe in class, see the video below. The two main things here are the daily practice leading to small continuos improvements and the train imitation exercise that lends itself perfectly to short practice sessions. To round things up I want to leave you with this little challenge. Make time for practice every day even if it is just 30 seconds and spend at least some of that time doing the train imitation. Let me know how it goes! Stay in touch by signing up to my newsletter below. Blues has always been my number one type of music when playing harmonica. Sure I have played some rock songs and even some folk songs bur blues is really where my heart is. However a few years ago Joe Filisko mentioned a player by the name of Isom Fontenot in a class I was taking so I checked him out. It turns out he was a cajun harmonica player and I was fanscinated by the sound of his playing. I was hearing a lot of toung blocking techniques and I decided to learn more myself and hopefully improve my blues harmonica playing. However it wasn’t very easy to find teaching material for cajun harmonica. I did get some material from Richard Sleigh and I used that to get started. In 2016 at Harmonica Masters Workshop in Trossingen Joe actually brought a cajun study song. It was actually a very nice mixture of blues and cajun making it a great study piece for blues harmonica players. This song allowed me to really work on my 3-hole blocks which have elluded my for quite some time. You can see the result below. If you are intereseted in purchasing the study material you can find it here. Joe has a lot of other great study material on the site. Sometimes it is good to step outside of your comfort zone to find new challenges and grow as an individual. For sure cajun music has made me a better blues player. I not only had to figure out how to play the song, I also had to figure out how to practice my new technique effectively and not just in isolation. This will be elaborate more in another post.